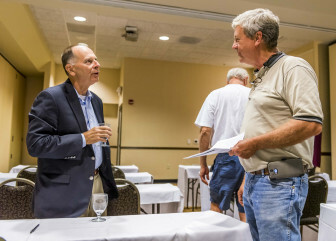 Bill Enyart, a lawyer and former U.S. representative, talks with farmers at the Hilton Garden Inn in Champaign, Ill., on Sept. 1, 2015. Bill Enyart, lawyer and former U.S. representative, spoke to a small group of farmers and landowners at an information session in Champaign in early September. The session was one of hundreds across the country that began in July to generate more plaintiffs for a lawsuit against Syngenta. Thousands of farmers – along with major agribusinesses Archer Daniels Midland and Cargill – are suing the Swiss chemical company Syngenta for selling a genetically modified strain of corn in the United States before its approval by China. China, a major market for farmers, halted U.S. corn imports back in 2013 after it detected the unapproved strain of corn in some import shipments. The trade disruption cost the corn industry up to an estimated $3 billion, according to National Grain and Feed Association. 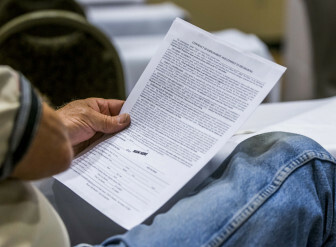 A farmer holds a legal agreement at the Hilton Garden Inn in Champaign, Ill., on Sept. 1, 2015. Although only about 3 percent of farms planted the strain known as Agrisure Viptera at the time, all U.S. corn was affected because it is hard to separate different varieties of corn grain. He said the company predicted that China would approve the strain of corn before it arrived in the country, but it was not approved until December 2014, one year later. Enyart’s law firm, Watts Guerra LLP, is one of many suing Syngenta on behalf of farmers and landowners for damages to the corn industry. The firm has invested $20 million in the suit and has begun processing 25,000 individual cases so far, according to Enyart. He cited that the trait was approved for cultivation in the United States in 2010 and that the company obtained import approval from other major corn importing companies. Lawyer and former U.S. representative Bill Enyart talks with farmer Dennis Riggs at the Hilton Garden Inn in Champaign, Ill., on Sept. 1, 2015. China’s rejection of corn hurt prices, but there were other factors that did, too. The Environmental Protection Agency’s proposed reduction in the ethanol mandate and China’s entrance into the U.S. sorghum market were contributing factors, University of Illinois at Urbana-Champaign research found. Taylor plans to talk with her brother, who co-owns less than 500 acres of corn and soybeans with her in Tennessee. She thinks signing up for the lawsuit would benefit them, she said. Other farmers were more skeptical. Enyart had not mentioned a downside to suing Syngenta, so Riggs asked what one good reason was to not sue. His firm gets a 40 percent success fee if they win the case, but farmers and landowners would not have to pay for any expenses in the meantime. Additionally, the firm is filing suits in Minnesota, where Syngenta Seeds is located, as opposed to filing in a federal case. Enyart said the advantage to this was that instead of getting a coupon for money off seed corn in the future, like in a class action case, there would be a gross settlement fee and the firm would simply send the farmer a check. “The only way to correct corporate bad behavior is to take money away from them,” he said.